Christy Mathewson was the handsome, talented, and charismatic star pitcher of early 20th-century baseball. He was elected to the Baseball Hall of Fame as one of its "First Five" inaugural members in 1936, along with Babe Ruth, Honus Wagner, Ty Cobb, and Walter Johnson, but didn't live to see it. He died tragically at age 45 from tuberculosis. 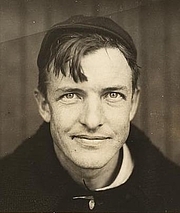 Christy Mathewson is currently considered a "single author." If one or more works are by a distinct, homonymous authors, go ahead and split the author. Christy Mathewson is composed of 3 names. You can examine and separate out names.